The city of Loveland has finished work on a large-scale solar power installation that aims to replace the damaged Idylwilde hydroelectric dam. 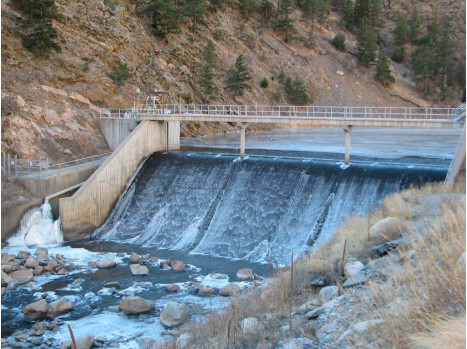 The dam, built in 1917, was badly damaged in the Sept. 2013 floods that devastated the Front Range corridor. Loveland received about $9 million in disaster recovery funds from the Federal Emergency Management Agency to construct the new Foothills Solar and Substation project, which the city says is capable of producing more power than the dam. The Idylwilde Dam’s hydroelectric facility was capable of producing 900 kilowatts of electricity before it was removed. The new solar project, on the other hand, has a capacity of 3.5 megawatts, more than tripling the output of the dam. City officials said the solar project is expected to produce about 6,813 megawatt hours of electricity each year — enough to power about 574 homes. To produce as much power as possible, the array uses solar tracking technology, which allows the panels to move throughout the day so they’re always facing the sun. Boulder-based Namaste Solar designed and built the solar array. The city said the project is the first energy-producing facility to receive approval through FEMA’s “Alternate Project” program, which permits the use of federal money for new construction when restoring a damaged building isn’t considered to be in the public interest. $5.1 million of the FEMA funds were used to build the solar array. The remainder will be used to construct an electric substation on the site. It’s expected to be completed in the spring.